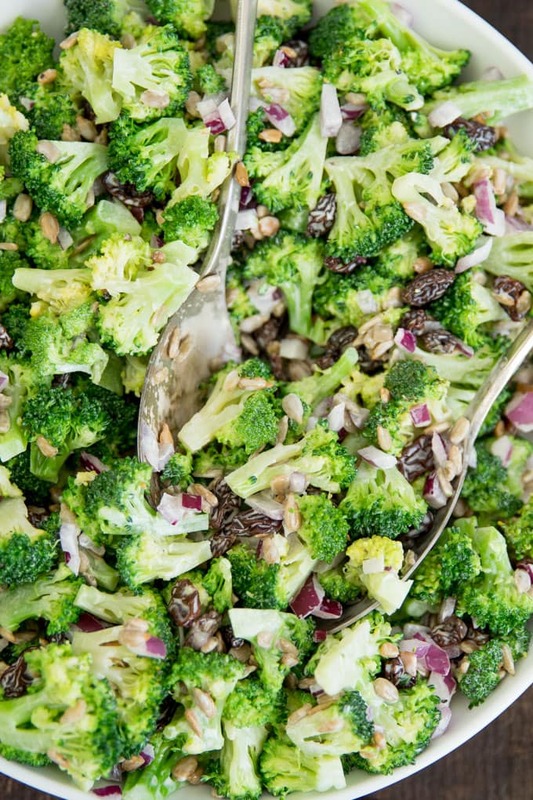 Broccoli Salad is a cool, crisp side salad that’s perfect for summer cookouts. 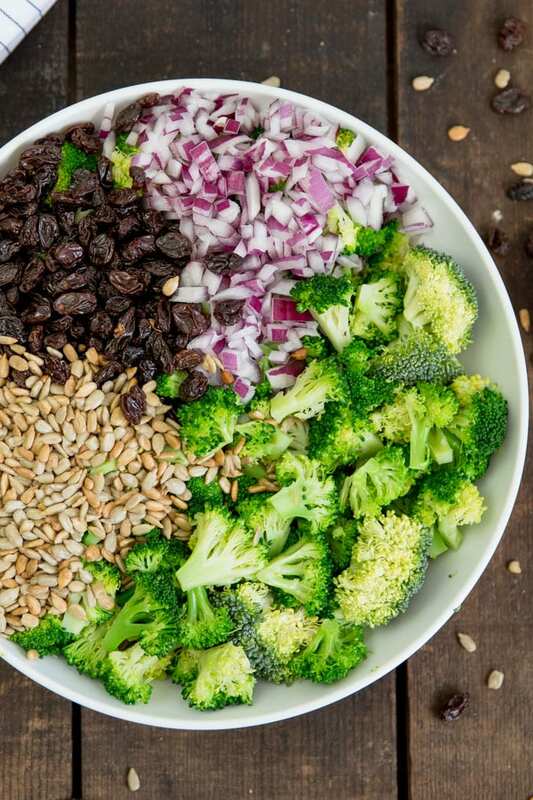 With a creamy, Greek yogurt and honey based dressing, crunchy sunflower seeds and juicy raisins, this salad is as delicious as it is light and healthy! Summer is almost here and we are counting the days until we can enjoy our favorite cookout food, like the Best Ever Classic Macaroni Salad and Spice Rubbed Grilled Tri Tip. 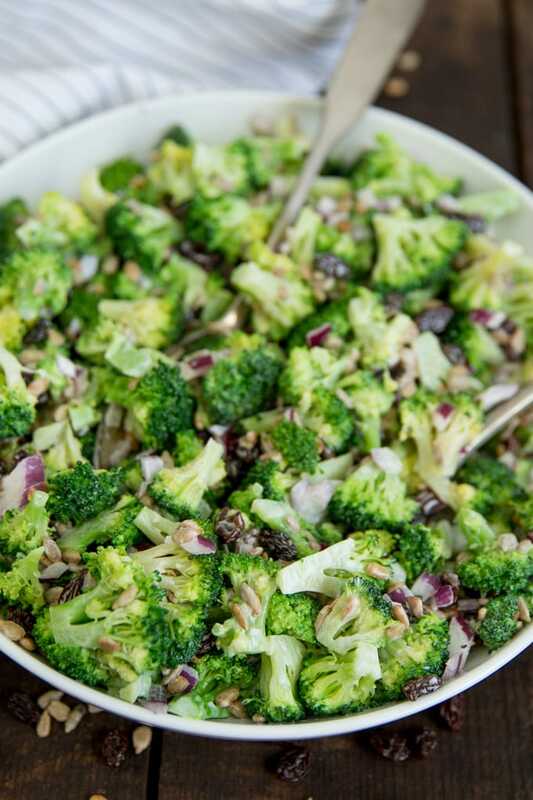 I know that we will be making this Broccoli Salad A LOT this summer! If you’ve ever visited Souplantaion you’ve probably tried their classic Broccoli Salad. It’s got a super sweet, creamy dressing, sunflower seeds, onions and raisins, just like this one. Oh, and broccoli. Really, really crunchy, chew like there’s no tomorrow broccoli. People love the stuff in all it’s creamy, crunchy glory. I too am a fan, but I just can’t get past giant chunks of broccoli that I feel like I need an iron jaw to chew. This is not your restaurant Broccoli Salad people. It’s so. much. better. I was insanely craving this salad recently and planned to make it as a side dish to our go-to Baked Chicken dinner. Both of my kids are currently in braces, which means gnawing on raw veggies is a strict no-no. I was still hell bent on making my favorite salad so I blanched the broccoli in a pot of boiling water and then drowned it in an ice bath to get it just soft enough to chew but still with that crisp bite that we love. Start with a large pot of boiling water. Add a good amount of salt to season the broccoli and pour the broccoli into the water for no more than 2 minutes. I found that a minute and 30 seconds worked best. Then immediately drain the broccoli in a large colander and rinse with cold water, then plunge it into a large bowl of ice water. This will quickly cook the broccoli and stop the cooking process. Lay out the broccoli on a flat surface like a cookie sheet that’s been lined with paper towels for the broccoli to dry. When you’re ready to assemble the salad, blot the vegetables with paper towels to remove any excess moisture and to keep from thinning the dressing. To make the dressing, whisk together a carton of plain Greek yogurt, a little mayo, apple cider vinegar and honey. You can add more or less honey based on your personal preference. I don’t like my dressings too sweet so I don’t use more than 2 tablespoons. *Note – since this is a lighter version, we are using Greek yogurt. However you can use all mayo or swap out sour cream if you prefer. If you don’t have the cider vinegar, use white distilled or even lemon juice. Combine the salad ingredients together and stir in the dressing to coat. You can serve this salad immediately or keep it in the fridge for 2-3 days. 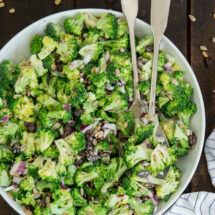 The broccoli has the most crisp bite on the first day, and the dressing may thin out a bit as it sits. Do you have to cook the broccoli? This is not a necessary step, but it does make the broccoli much easier to chew. It’s a personal preference so it you’re short on time you can skip the blanching step. How long can broccoli salad sit out? Because of the mayonnaise, broccoli salad can spoil if left out for longer than 2 hours on the counter. For outdoor parties, keep the salad in the shade and discard after one hour. How to customize this salad? 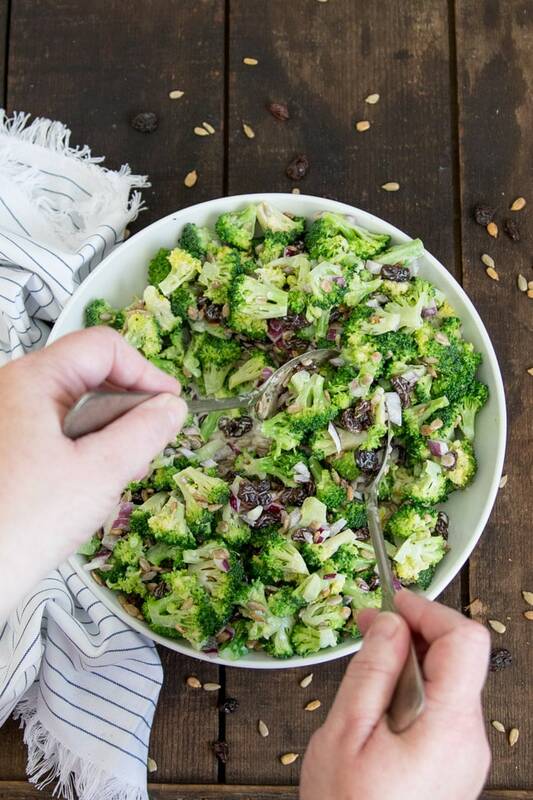 There are lots of ways you can customize my broccoli salad recipe! Add more veggies! Shredded carrots, cauliflower or bell peppers would be an delicious addition. For a savory salad, use just a teaspoon of honey or leave that ingredient out altogether. If you’re looking to sweeten things up, use candied nuts or seeds. 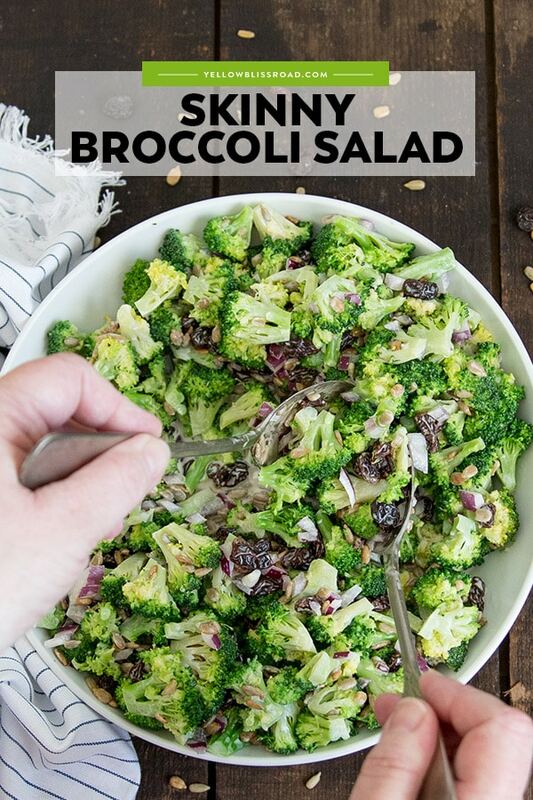 You don’t have to use the mayo if you want to keep your broccoli salad even lighter. Just use more Greek yogurt or a fat free sour cream in its place. 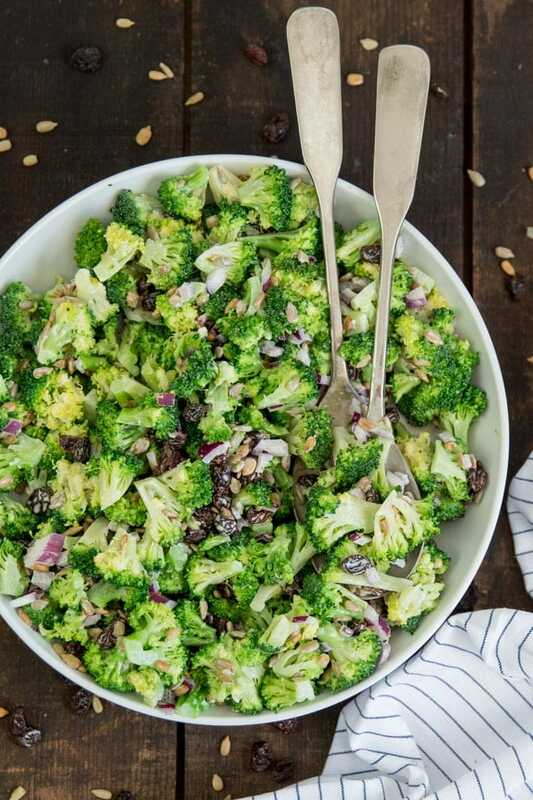 Broccoli Salad is a cool, crisp side salad that's perfect for summer cookouts. With a creamy, Greek yogurt and honey based dressing, crunchy sunflower seeds and juicy raisins, this salad is as delicious as it is light and healthy! Fill a large bowl with ice water and set aside. Fill a large pot about halfway with water, then bring to a bowl. Add a couple tablespoons of salt, then the broccoli. Cook the broccoli for 1-2 minutes, then immediately drain and rinse for a couple of minutes with cold water the place into the ice bath to cool and stop the cooking process. Lay flat on a paper towel lined surface to dry, or use a salad spinner, then blot any excess water with paper towels. Refrigerate until ready to use; up to 24 hours. Combine dressing ingredients together in a small bowl. Add broccoli and stir to coat evenly. Add remaining ingredients and stir to combine. 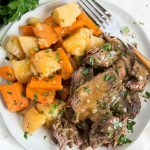 Serve immediately, or refrigerate for up to 48 hours in an airtight container, then stir before serving. If salad seems dry, add a little more mayo and/or greek yogurt.